Sometimes Yoga is for those who practice it…and for us, we know that familiar feeling of arriving on the mat. It changes us. We instantly breathe a little better and sit a little taller and feel a little more connected. But in my experience, it also impacts those who don’t ever make it to the mat. The ones in high-heeled shoes and nylons. The ones in ties and button up shirts. The ones with deadlines and assistants and a schedule packed so tightly that they’ve forgotten to schedule time to eat. These are my people. 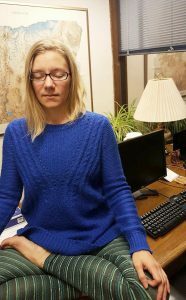 I teach in corporate offices and the people who make it to class get a chance to stretch out, relax and breathe during their days. Other than the occasional disruption from email/text coming through on their cell phones or their bosses coming in for an answer that can’t wait, classes are pretty similar to those in studios. But one thing I’ve noticed over the years teaching in offices is how my presence affects the people who never even come to class. The security guard who lets me in, the people I see on the elevators or in the parking lot…often they’ll stretch their arms overhead or do a little back arch just when they see me. “You coming to yoga?” I say, knowing the answer. This always somehow brings about laughter “you wouldn’t want me to come to Yoga. I can’t even touch my toes. I’d hurt myself. I’d fall asleep. I don’t have time!” (and other reasons) Sometimes I’ll have them quickly side bend or tell them to shoulder roll at their desk. And they do it. Most importantly, they know that Yoga is there for them. Often times it’s just a few feet away. It’s maybe the closest some of them have ever been to the possibility of practicing Yoga. And I like to imagine that during that lunch hour, even though they’re not in class, they’re aware that somewhere, close by – Yoga is happening. Maybe they are eating with more mindfulness. Maybe they are stretching their feet out under their desks. 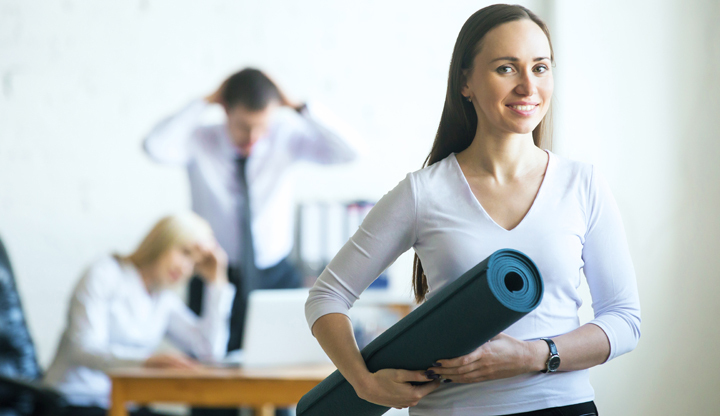 This post is the first in the 4-part series about teaching yoga in office settings. Tune in next week for Part 2: How to sequence office yoga classes. Hi Alison. This brought back a memory & made me smile. I used to teach nurses & other staff members at a local hospital. One day the security guard mentioned that he usually watched our practice via his security monitor. Now I’m thinking he may have been practicing along with us a little. Thank you for the memory & for being there for those you teach. Haha – I’ll bet he was. I love it! Such a great image 🙂 Thanks for reading! You are such a wonderful teacher and human being!!! I love the article, they are all lucky to have you. This warms my heart. I want this for everyone! Great article. Hopefully more and more people will catch on to the serenity and strength we all gain from yoga.